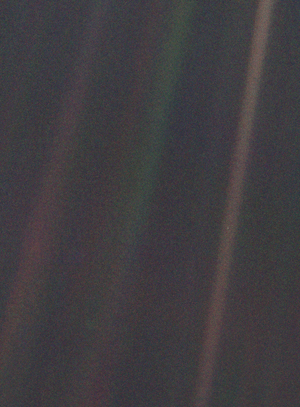 The Pale Blue Dot is a photograph of planet Earth taken in 1990 by the Voyager 1 spaceprobe from a record distance of about 6 billion kilometers (3.7 billion miles) from Earth, as part of the solar system Family Portrait series of images. If you enjoyed reading that, you might be enlightened enough to enjoy this bit from George Carlin’s stand-up on God and religion. This entry was posted on Monday, March 3rd, 2014 at 4:48 pm and is filed under General Stuff. You can follow any responses to this entry through the RSS 2.0 feed. You can leave a response, or trackback from your own site.